What we have to hope for, then, is the show finding ways to mitigate the storylines that aren’t working by building episodes that highlight what is working. And although “Church Of Gay Jesus” is named after an Ian storyline that still isn’t sitting right with me, I thought it did an effective job at grounding much of its storytelling, and finding important moments to bring the family together to observe one another’s escalating circumstances. It’s not necessarily a significant step in the right direction, but it’s more sure-footed than the show has been for some time, and at least raises hope the last two episodes will bring the show back around. My central issue with Ian’s story has less to do with the story itself and more to do with what the story hasn’t become. That may seem unfair, but the way the show raised the possibility of Ian’s bipolar disorder driving his behavior and then promptly ignored it has made the slowburn of this story confounding. Even here, when Trevor and Fiona have a meaningful and adult conversation about Ian’s cult status as a “Gay Jesus” figure, they don’t circle back around to whether or not there’s something wrong with him. If they had never raised that possibility, I think I’d find this story less frustrating: if we skip over Ian going overboard trying to destroy Fiona over something he clearly didn’t really care about (given how he completely ignores the shelter event Trevor planned), I like the dynamic of Fiona helping Ian through his anxiety over whether he can really help those kids. But the show created too much baggage—as much as I liked seeing Ian and Fiona back on better terms, and appreciated that and other scenes that brought the family together, I was unclear how we got here, and whether the show is just ignoring everything that happened or just being far too slow in getting back to it. Speed is a central issue in Fiona’s ongoing relationship with Ford, which I continue to struggle with as well. I thought the story was clear enough here: Fiona is still adjusting to how to function as an independent person, but whereas she’s unsure of herself, Ford reveals he’s intimidated by how decisive she’s been in her life, as gleaned from all sorts of personal conversations he had with people in her life behind her back. The themes of the story make sense, but I can’t get over how much I dislike him. Fiona is right that he’s only ever talked about himself, and him dismissing it as fearing her confidence doesn’t excuse the fact that he’s been an obnoxious tool to her in nearly every situation we’ve seen. I’m glad that Fiona is sexually satisfied, and has someone to help her pick out furniture, but there’s a pretension to Ford that keeps him from seeming like a viable love interest, and that’s making it tougher to invest in the story. My issues with Ford may pale in comparison to my issues with Kassadi, but the principle is the same: these are characters that just don’t fit into this world. But whereas Ford just kind of seems like a bit of a sod, Kassadi is just too crazy, and it’s still not working for me. I will say, though, that I appreciated the way this episode used that craziness to its full potential: Sammi Hanratty (Young Chuck from Pushing Diaries) has certainly committed to the madness, which has grown on me a bit, but the improvement comes from how the show uses the tonal whiplash she creates to say something meaningful. 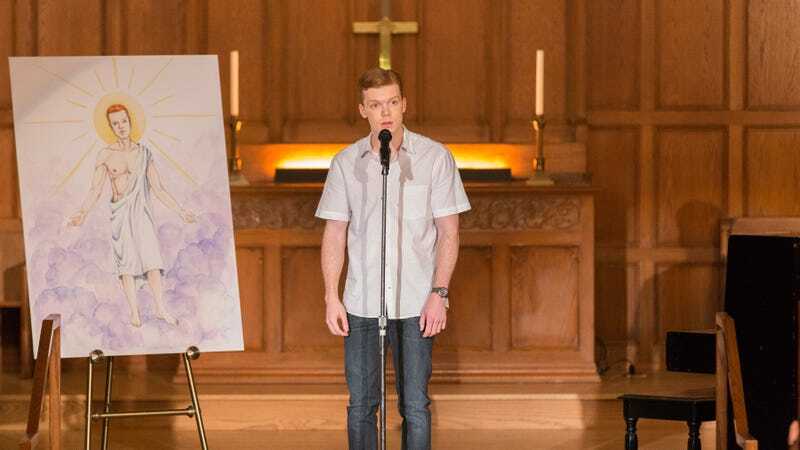 There’s this great moment where Carl and Kassadi’s argument continues as background noise while Lip sits, in his own world, pondering what he’d say about Youens at his memorial service. Shameless can sometimes be a deeply schizophrenic show, and there are detriments to that which are evident in this episode, but in that moment the show acknowledges the different planes, and uses it to tell us something about Lip even if I’m still waiting for Kassadi to tell us something meaningful about Carl. Lip’s story is, again, the highlight. Youens’ death comes as a shock to Lip—he shows up at the prison for visitation and discovers that he died earlier in the week, information he didn’t learn because none of the people who were notified (his daughter, the school) were even aware Lip was in his life. Jeremy Allen White nails the anger of the situation, sure, but what I appreciate most is that his reaction is messy. His anger is at a lot of things, none of which he lays out too cleanly. Perhaps he’s angry because he realizes that he wasn’t the only one that Youens took an interest in. Or perhaps he’s angry that, despite Youens strong recommendations, he wasn’t able to live up to his potential like the other students who speak at Youens’ memorial. And he’s also just angry that his mentor and friend is dead, gone to the same disease that could claim his own life if he’s not careful. It’s a nuanced approach to the story, and leaves Lip at an uncertain juncture, not sure of where to go next. The end of the episode brings some clarity there for the show as a whole: as I expected when Stacey Oristano auspiciously appeared as his wife last week, the man who fell from her roof has turned into a lawsuit in addition to a somewhat forced occupation of Fiona’s apartment, and Debbie suffers a workplace accident of her own working as a scab welder. But while the plot has certainly thickened, neither of those stories sound particularly exciting to me, and it’s still frustrating to see a character like Frank just tagging onto Ian’s story instead of doing something significant like earlier in the season. It still feels like a lot of what the show set up earlier in the season—Liam’s trouble at school, for example—has dissipated, creating an absence of momentum even if this week registers as an improvement over the past few outings. So now Svetlana is a sadsack who has no self-confidence, making Kev and Vee her sugar daddy gurus? That’s such a bizarrely sudden turn of events, and I still don’t care about any of it. As someone who had to really furnish an apartment for the first time recently, I can relate to Fiona’s response to how much chairs cost. Chairs are expensive, y’all. I was struck in Lip’s story by how straight everything was played: there was no joke in the woman at the prison’s revelation that Youens had died, and his daughter Tabitha never registers as a “character” who Lip encounters. It’s like his story is happening in the real world, which is fitting but also a bit jarring when we cut to sillier fare. It really makes me wish the entire show was like this, as much as I know that’s never going to happen. “Accident? You know he was arrested for a DUI, right?”—I liked that Tabitha and Lip saw Youens’ recent actions so differently. I appreciated the small moment when Fiona acknowledges—before the lawsuit—that the injured worker and his family aren’t terrible people. They aren’t squatting—she invited them to stay—and they’re just hustling in the same way that she did for so long. It’s a nice moment of self-awareness, albeit one sort of undone by the legal situation. As noted, I’m still not here for the Kassadi story, but her rush to hang herself when she hears Carl coming made me chuckle. Even pointless psychopaths can get a laugh sometimes.